and thanks to the two week long pasta eating marathon Italian adventure that I’ve been on I have all kinds of new ideas and tastes running around in my head that I can’t wait to get to sorting out so I can share some of that goodness with you guys. but before diving headfirst back into pasta I think my body is ready for a tiny break from all those (delicious) carbs and cheese and cured meats. mmm. so after a crucial dinner at din tai fung to try and shake off the jet lag (at least a little bit) the first order of business back in my own kitchen is some of my favorite hummus with all of the garnishes. aka my homegirl hummus. this recipe is the result of a lifetime of experimenting. I’ve probably made hummus at least 20 different ways and none have made me as happy as this one. it’s super easy and right to the point. the method is mostly inspired by ottolenghi’s very famous version (rightfully so – it’s pretty fantastic) except I skip cooking the beans myself as I rarely remember to soak those chickpeas/have the time to wait around for them to cook when it comes to making hummus. it’s a food of convenience for me. something I love throwing together when there’s unexpected friends heading over or as sunday night snack prep for the week ahead. your food processor is going to need an ice bath after this workout! as all the major players get thrown in for a good 2-3 minutes until a stiff (mostly) smooth paste forms, after which you’ll add a little bit of ice water until the desired consistency is reached. 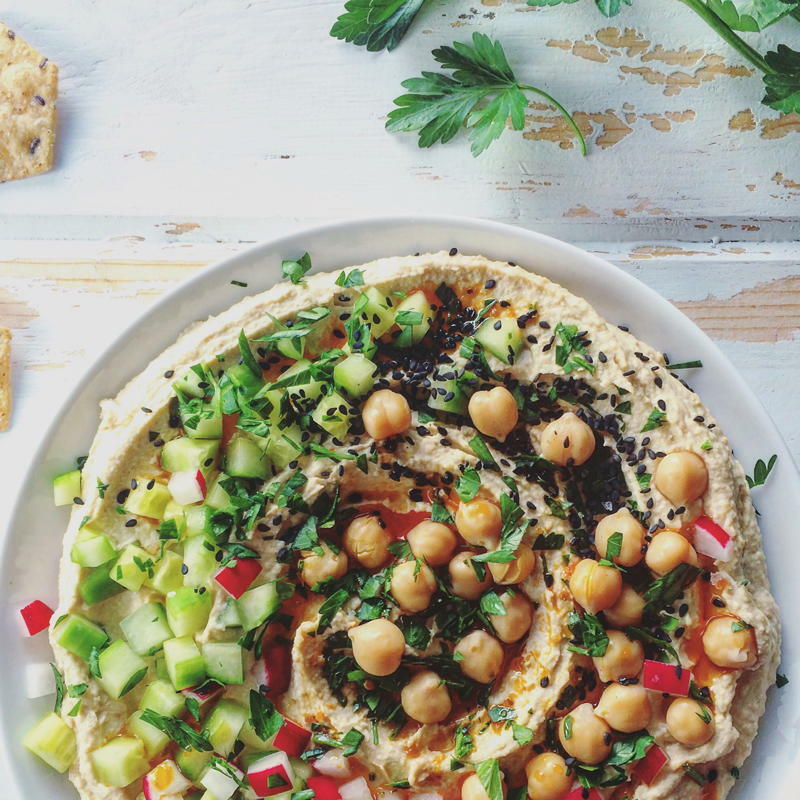 I prefer my hummus to be on the thicker side, especially when adding allll the good things on the top – it just holds up better. but if you like it thinner go right ahead and add some more water, just do it a little bit at a time so you can keep track of where you’re at. the last and final step is to decorate your plate with any pretty garnish that you like. go wild and get creative! the possibilities are endless. 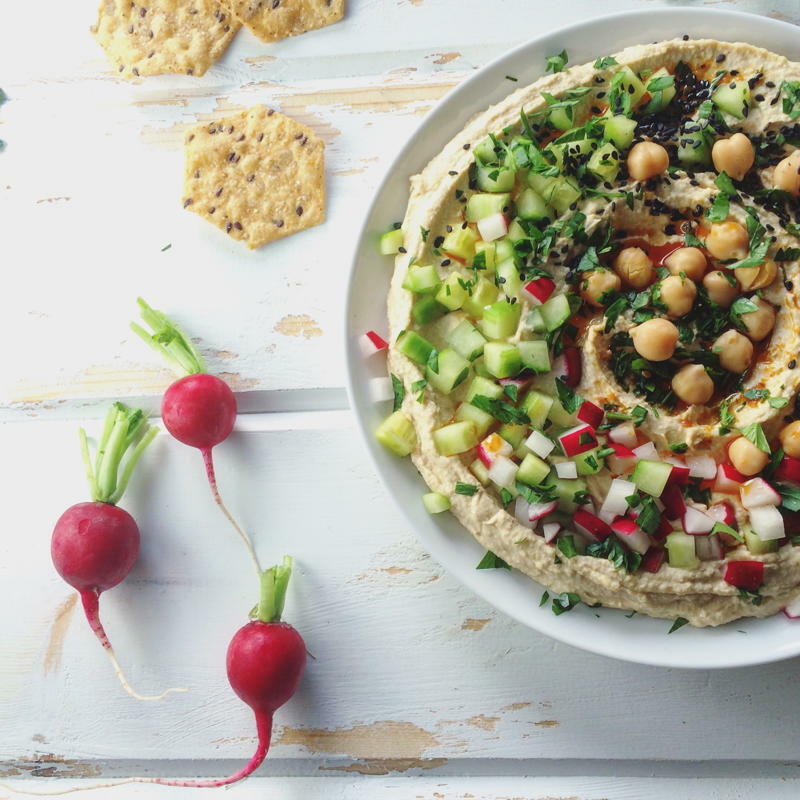 it’s time for a hummus upgrade, and this plate has the homegirl upgrade written all over it! a simple hummus recipe garnished with cucumber, radish, sesame seeds, whole chickpeas, parsley and chili oil. drain chickpeas, reserving about 1/3 cup of the liquid. rinse well. set aside about 1/4 cup of the whole chickpeas to use for garnish, add the rest to the food processor. add the rest of the ingredients to the food processor except ice water (tahini, salt, lemon juice and garlic clove). turn on and process, adding the reserved bean liquid about 1 tbs at a time – just enough so that it remains a stiff paste but everything is moving smoothly (you will adjust the consistency later with the ice water). I usually add between 3 and 4 tablespoons. stop to scrape down the sides if necessary. after blending for about 2-3 minutes add the ice water 1 tbs at a time with the motor running until your desired consistency is reached. 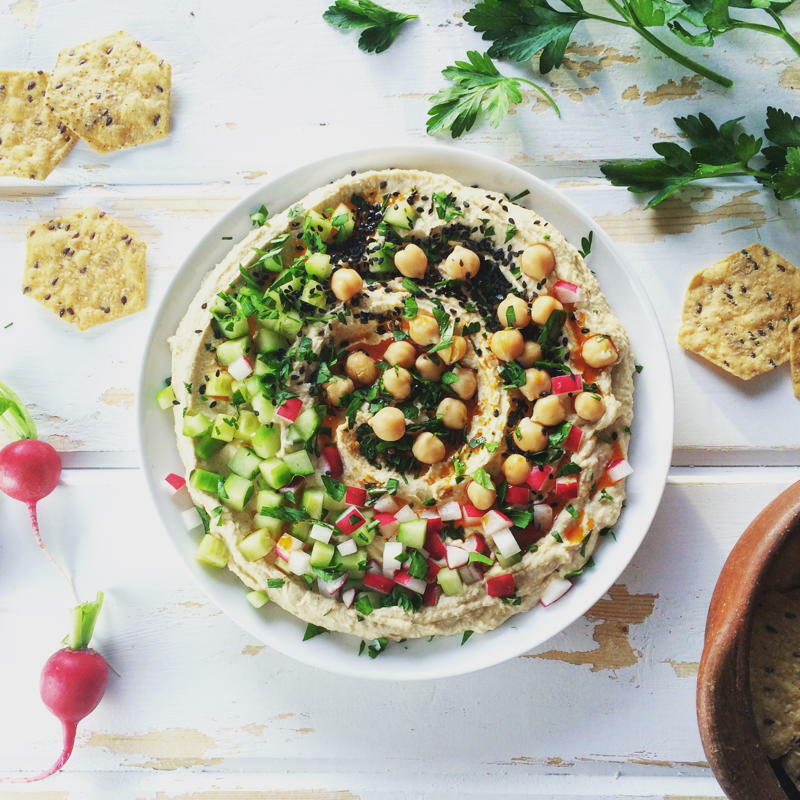 for a thicker hummus I use about 3 tbs, but you may want more if you would like a thinner result. taste and add more salt and lemon juice if desired. plate and add any desired garnishes, sprinkle with coarse sea salt just before serving! 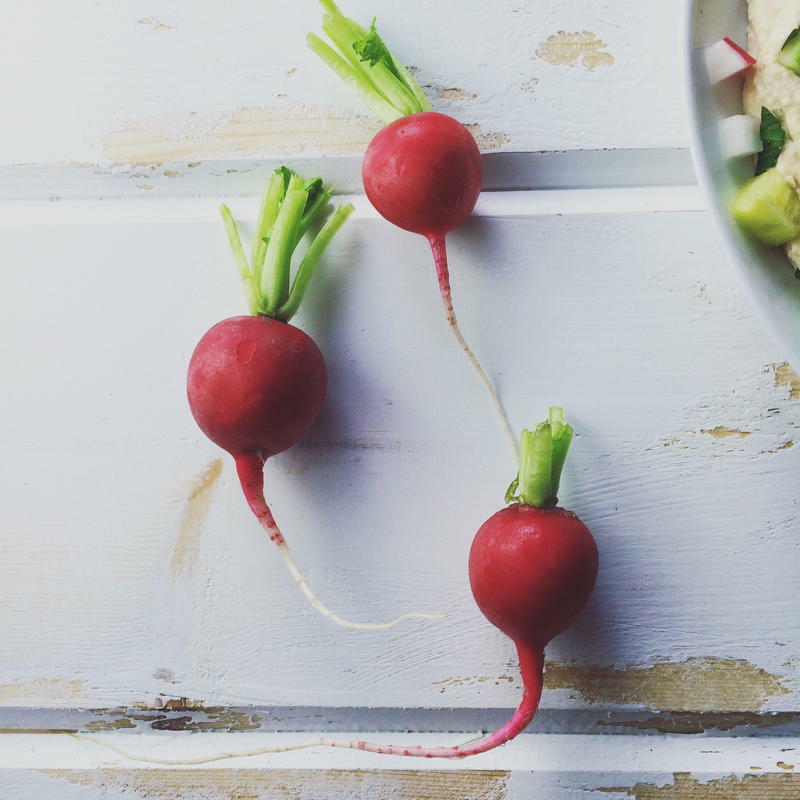 This entry was posted in snacks on October 5, 2015 by Nyssa Tanner. it’s not that far right? I would mail you some of this in a heartbeat if I could! !